When I roll the dice do I have to add all the numbers, or multiply all the numbers? You may manipulate the dice any way you’d like. You may make any combination of the numbers. You could use any of those equations to find a number that will help you get 5 chips in a row horizontally, vertically or diagonally. The dice have 12 sides, how do I know which side I am supposed to play? The side that is facing directly up is the side you use. They refer to the different levels, at which you may choose to play. Most people play at the Introductory level until they become familiar with the game. The levels increase the challenge. What if I cannot make any combination for a number that is still available on the board? As long as you are playing the entire board that rarely happens. Sometimes you are forced to start a line of chips somewhere that is not beneficial to you, but you can still play that roll. When you play at the more advanced levels, it is more likely to happen. If you can’t make a combination for any number that is available, you will need to skip your turn. 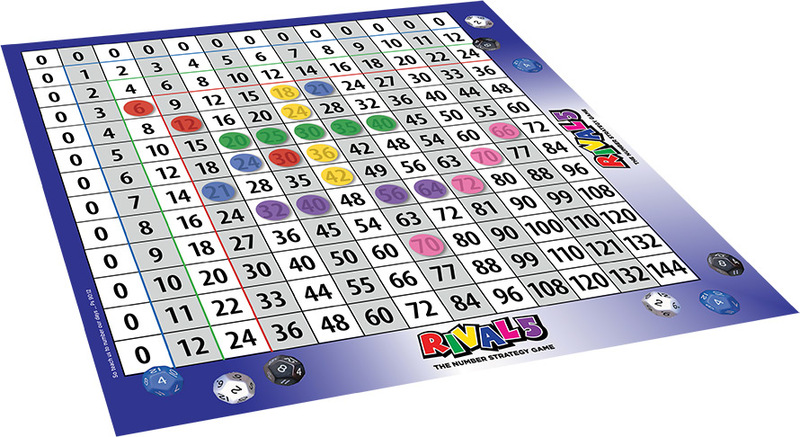 Why are some numbers not on the board, like 13, 39, 57 etc? All the numbers are multiples of one other number on the board and the numbers go up to only 12.